Not long ago, I had my grands at a local restaurant. Like all kids, they finish their drinks long before the meal comes. They looked disappointed like I would say no to another drink; I reminded them, “It’s ok. They have free refills”. Those words totally changed their moods from distraught to giggling. They were enjoying their meals and having Nanny time; all was right with the world again! Wow! This is how we should feel when our cups become empty. We know God gives endless “free refills”! Thanks be to our Lord Jesus Christ. 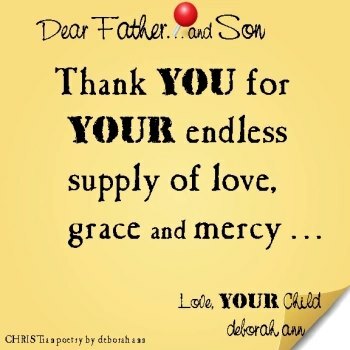 Praise God, we have continuous refills of Grace, forgiveness, love and mercy only in Him! The next time you see a “free refill” sign, be reminded of the life we have in Christ Jesus! Amen! Have a blessed day!